The Ledges Golf Club offers a world class 18-hole championship course surrounded by the majestic red and white sandstone cliffs of Snow Canyon State Park. 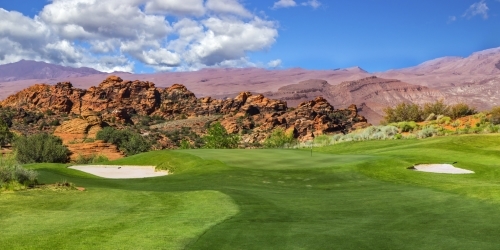 Located only five miles North of St. George, The Ledges offers a memorable experience at an average of 5-10 degrees cooler than other courses in Southern Utah. The Ledges of St George reserves the right to change price and offer at anytime. Prices and offer are subject to change without notice. GolfTrips.com is not responsible for errors posted in this golf package.